WWIIReenacting.co.uk Forums • View topic - 4 Engined Heavy Bomber. Post subject: 4 Engined Heavy Bomber. Many years ago (35), I saw a photograph of a Japanese 4 engined heavy bomber. As far as I can recall it looked liked a B 26 Marauder but much larger and 4 engines instead of 2. I think it was made by Kawanishi (?) or Kawasaki (?). I had forgotten all about it until the other day, when someone mentioned, "Japan did not have a heavy strategic bomber at all". I said they did but could not remember much about it, if any thing. Could you throw light on it? Am I right or wrong? Did Japan have an aircraft on these lines? Stranger,when you go home,tell them of us ,and say"For their tomorrow,we gave our today". I may not agree with what you say,but I will defend the right for you to say it. Post subject: Re: 4 Engined Heavy Bomber. Paul, wouldn't it be a Kawasaki Ki-91 equipped with 4x Mitsubishi Ha-214 radial engine? the Kawasaki Ki-91 prototype was only partially completed when the factory was destroyed by B-29's in 1945. There was also the The Nakajima G5N Shinzan (Mountain Recess). Only 6-7 were built, 4 being used for long range transports. Ryan what was the plane code named "Mount Fuji" ? Lloyd i believe the Fugaku (Mount Fuji) was the proposed ultra-long range heavy bomber. 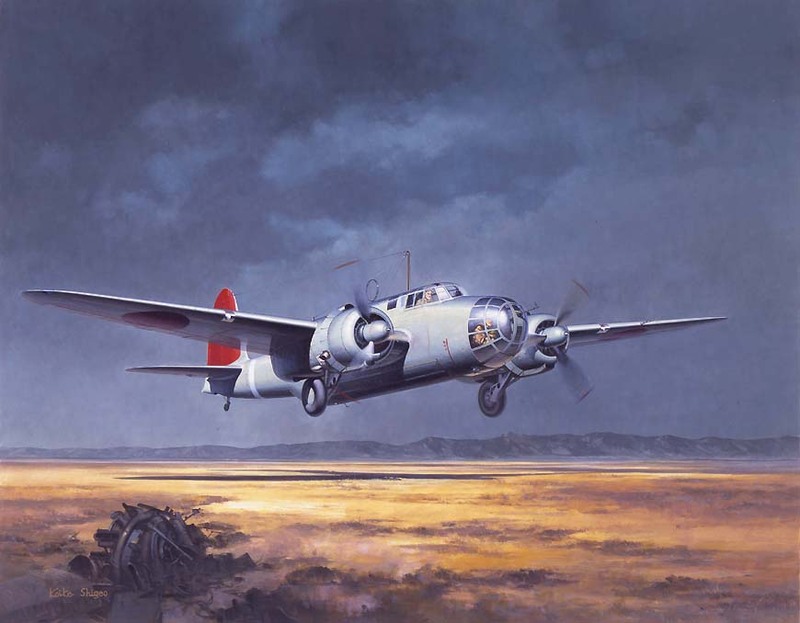 The Fugaku had its origins in "Project Z", a 1942 specification for an intercontinental bomber which could take off from the Japanese-occupied Kuril Islands, bomb the continental United States, then continue onward to land in German-occupied France. Once there, it would be refitted and make another return sortie. Project Z called for three variations on the airframe: 4,000 bombers, 5,000 transports (capable of carrying 600 troops), and 2,000 strafing attack aircraft, which would carry 400 downward-firing machine guns in the fuselage, for intense ground attacks at the rate of 6,400 rounds per second. While the project was conceived by Nakajima head Chikuhei Nakajima, Kawanishi and Mitsubishi also made proposals for the Fugaku. The Nakajima design had straight wings and contra-rotating four-blade propellers; the Kawanishi design had elliptical wings and single four-blade propellers. To save weight, some of the landing gear was to be jettisoned after takeoff (being unnecessary on landing with an empty bomb load). Both designs used six engines. Development started in 1943, with a design and manufacturing facility built in Mitaka, Tokyo. While Nakajima's 4-row 36-cylinder Ha-54 engine was abandoned as too complex, Mitsubishi successfully built the 2-row 22-cylinder Ha-50 engine for the Kawanishi design, testing three units in May 1944. An example of this engine was unearthed in 1979 during expansion of Haneda Airport and is on display at the Narita Aerospace Museum. Project Z was cancelled in July 1944 and the Fugaku was never built. The aircraft was more of a "cigar" shape fuselage, with tail wheel. It ressembled a larger,much larger, B-26. Wether it was a mock up,(wood and canvas), for propaganda purposes I do not know. However the manufacturers name began with a K. Down to the reference library for me. Defensive armament proposed was that of two 20 mm cannon and six 13 mm machine guns. Bomb load variables could be a 1,760-lb. bomb or torpedo, two 1,100-lb. bombs or six 550-lb bombs. This project was cancelled due to shortages and long lead time to completion. E-COMPANY,2ND BATTALION,16TH INFANTRY REGIMENT, 1ST US INFANTRY DIVISION. I'm sure there will be more info on t'internet, good luck. AFMC’s Motto: VIVAMVS AD MEMORIAM “We live as a Memorial".